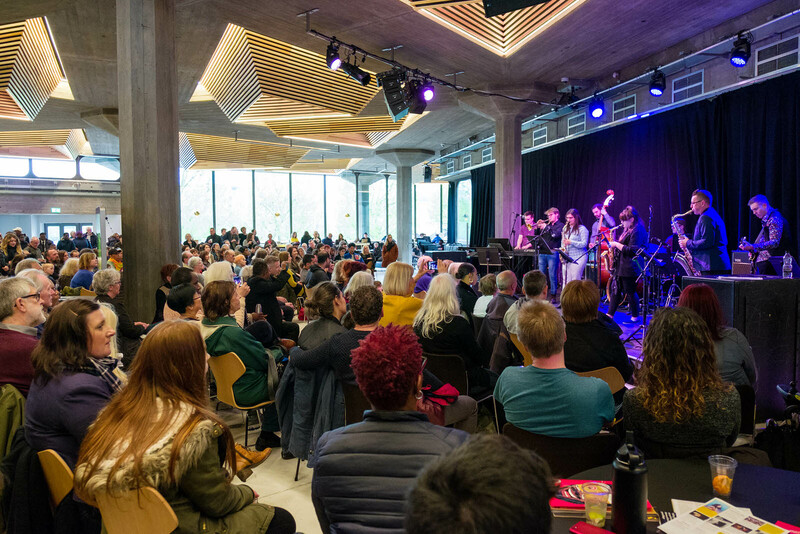 Sunday 29 April we wrapped our epic 18-month-long nationwide education and concert tour project, The Jazz Ticket with a packed day of live music and masterclasses at our creative home at Southbank Centre, London. The Jazz Ticket marked the centenary year of the birth of six Giants of Jazz: Ella Fitzgerald, Dizzy Gillespie, Mongo Santamaria, Thelonious Monk, Tadd Dameron and Buddy Rich. From January 2017-April 2018 The Jazz Ticket enabled 834 young musicians in 49 schools to learn about the life and music of these icons, and to play their music in public concerts in prestigious venues in their city. Our final show, at the newly refurbished Queen Elizabeth Hall, had the venue simply buzzing with the energy, enthusiasm and fantastic sound of almost 200 young musicians playing jazz. 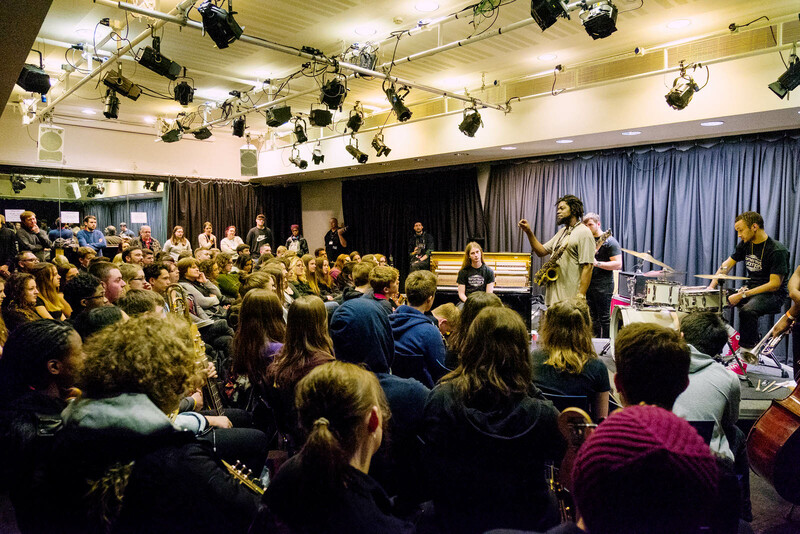 The day began with an inspirational workshop led by acclaimed Tomorrow’s Warriors alumni, Soweto Kinch who, working with the Tomorrow’s Warriors House Band, managed to run through the entire history of jazz and even found time to get everyone playing their arpeggios at the end! The schools then broke out into jam sessions and watched screenings of the Brownswood film We Out Here, depicting the current London jazz scene which Tomorrow’s Warriors have played a crucial part in helping to create. Meanwhile, the seven schools we had worked with across London were sound checking for their evening performance in the recently opened Queen Elizabeth Hall. 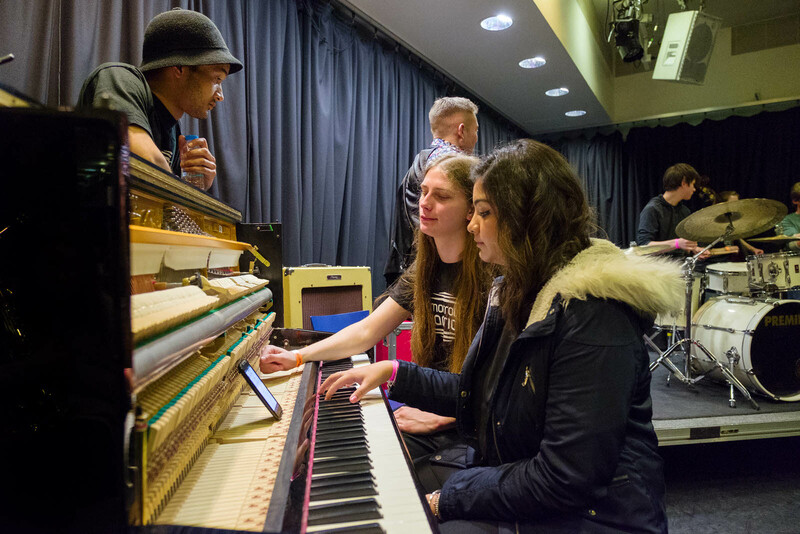 In The Jazz Ticket National Finale, young musicians from Manchester, Hull, East Riding, Southampton, Brighton and Loughborough were able to showcase what they had learnt from their experience of The Jazz Ticket. The Queen Elizabeth Hall foyer was completely packed and they even got some audience members dancing! The eight London schools with whom we’d worked in 2018 then performed on the main stage in Queen Elizabeth Hall as part of our headline concert, A Journey with the Giants of Jazz, combining archive footage of our six Giants of Jazz with the young people’s creative and energetic performances. They were then able to watch the world class Nu Civilisation Orchestra led by Peter Edwards, featuring dizzying solos from special guest Soweto Kinch. For the grand finale at the end of the show, the London schools and Nu Civilisation Orchestra came together for an epic rendition of Dizzy Gillespie’s Cloud Nine. The event was a massive success, artistically and organisationally and, through The Jazz Ticket, we hope to have played a role in inspiring the next generation of jazz musicians. Here’s a lovely message received from The Charter School. On behalf of all the students who took part in last night’s wonderful event and the school, I would like to extend our deepest gratitude for the amazing opportunity we were afforded by your organisation. The students are really very grateful and, though a little sleepy today, are buzzing with pride and a sense of achievement. It was such a joy to be a part of a beautiful and educational event and I know for a fact that many lives were positively changed yesterday. We are all aware how hard you’ve all worked to make ‘The Jazz Ticket’ come together and it was good to see all the other schools and young people begin or continue this wonderful and very real musically educational journey. The Nu Civilisation Orchestra were simply sublime and I’m sure you are all very proud. I know many of my group will be joining Tomorrow’s Warriors as a result and some are already looking forward to next year’s show! With all the arts budget cuts that are happening across the majority of state schools in the country, last night and the work you do all year round is a testament to why arts organisations are so vital and the life-blood of of our current and future young musicians. Warm thanks to all of our participants and partners who joined us on this epic journey and to our amazing team of staff, music leaders, musicians, photographers and crew who made The Jazz Ticket such a major success! Here’s looking forward to The Reggae Ticket in 2019! Great write up, I had a great time but there was clearly lots going on which I didn’t even see, Tomorrows Warriors should be really proud and the testimonial from Francis Winston really hits the nail on the head. A Huge Thank You to The Ronnie Scott’s Charitable Foundation for Helping Us Jam!